As the goals of mass public relations and community relations programs are to gain public attention and interest in public health in general and chiropractic in particular, these subjects will be emphasized in this chapter. The development of patient desire and action is a function of the individual practice. This was shown in the previous chapter, and it will be embellished in this chapter. Regardless of the public relations or advertising methods used, there can be little practice or professional growth without patient interest and desire. Be they good or bad, everybody has public relations. Positive public relations is that attitude and course of action taken by any individual or group that desires to identify its actions and goals with the welfare of the people to gain widespread understanding and good will. Public relations in chiropractic can be approached from both an individual practice viewpoint and a professional viewpoint, and these are overlapping and indivisible functions. That is, what is good public relations for the doctor is good public relations for the profession at large, and vice versa. Thus, a well-planned, high-quality, national public relations program will profit the profession little if individual practices are not imbued with the attitude of positive public relations and the development of safeguards that make poor public relations impossible. Ethics, a service-oriented attitude, and high-quality conduct are the basis upon which any public relations program must be built. Public relations begins in the local community and takes shape through the contacts of individual people with one another. In both the business world and the professions, a good reputation is founded on good works that are communicated truthfully and candidly. Public relations is not the propagation of favorable publicity regardless of merit, nor is it phony promotions and cheap publicity stunts designed to manipulate public opinion. It refers to true identification with the public welfare -- education to mutual concerns, operating in the public interest, and communicating this performance. As the business world has learned that it can, and must, take a careful account of the attitudes and wishes of the public before it evolves its programs of action, so must any health profession. It must be realized that the modern doctor of chiropractic is a combination of scientist and healer, and this integration has led to growth from fixed orthodoxy and sometimes illogical traditions. As healers, we must be aware of basic psychologic and human-relations facts that contribute to the "art" of our profession. Poor public relations, ill-will, and resentment take place when either doctors or their assistants fail to identify with the patient's situation. Patients inevitably react negatively to a procedure or transaction when they are expected to understand without knowing the facts as understood by the doctor and assistant. Thus, it is each doctor's and assistant's responsibility to give the facts to the patients and to the public. Your professional image begins to bud within an individual patient with the first telephone contact with your office. It grows with impressions from the quality of your office's location, exterior, interior furnishings, overall cleanliness, and the service and hospitality offered. It matures further during your consultations and examinations, and it ripens during therapy and the human relations involved. This image is inseparable from your basic professional reputation in your community. Most all practice consultants believe a doctor opening a new office should advertise, but they differ in the means applied. The verb advertise means to give public notice of something or someone. In its true sense, we advertise ourselves by the way we speak, listen, dress, and walk, for example. We advertise what we are by our gestures, facial expressions, and postures. We advertise who we are by the office in which we work, the car in which we drive, the house in which we live, and the organizations we join. We are known by whatever actions, possessions, identifications, or attitudes we advertise. We advertise by the dignity of our professional cards, letterheads, statements, and envelopes. By what we exhibit, we create an image of ourselves and our practice. The effect is the result of the impressions made. The "human touch" has been emphasized throughout this manual. A doctor should never become so preoccupied with the case to the neglect of the person involved. It is truly unfortunate that many patients neither look for nor evidently expect to find in their doctor the same qualities of compassion, sympathy, and reassurance that were once taken for granted in the healing arts several decades ago. But this attitude is held with reluctance. Patients would prefer a doctor who is more important as an individual than all his scientific skills and instruments. Patients would prefer a doctor who, in turn, rates the patient as being more important as an individual than the disorder being treated. The best public relations methods are not usually recognized as "public relations" efforts. They are the human relations aspects of health care described in the previous chapter --a friendly smile, a gentle touch, attentive listening, a reassuring remark. Nevertheless, these basic acts of service must be extended far beyond your office walls if practice development is to reach its optimal level. Traditionally, the quality professional announcement card has been the major direct mail piece used to attach new patients. Within the ethical framework of professionals, it simply states the doctor's name, address, type of practice, and office hours in which appointments are scheduled. Besides the friends, acquaintances, and contacts you have made, your initial mailing list should include people new to the area because they will most likely not have established a firm relationship with another primary health-care practitioner. A list of "newcomers" can usually be purchased from a letter shop specializing in direct-mail campaigns. A change in location, remodeling, opening of a satellite office, an anniversary, or any major event in your practice offers an opportunity to hold a community "Open House." The event should be publicized extensively locally and planned so it does not conflict with normal office hours, church hours, or other publicized major events when possible. Light refreshments are in order as are some quality literature. Aside from your personal appearance, your professional card will do much to add to your professional image if it is designed in good taste. Use the finest quality you can afford without appearing extravagant. Keep it dignified, and avoid attempting to cram as much information as possible in a small space. Your name, title, address, telephone number, and possibly an optional logo is all that is necessary. Save other details for your consultation. It will give you an opportunity to explain the full scope of your practice's service benefits. When benefits are above what people expect, the happy surprise is motivational. Select your stationery only after careful deliberation. Have it as dignified, simple, and as professional as is possible. Type style, size of type, overall design, and the quality of bonded paper used are all important. Most all print shops of any stature will have many professional samples from which to choose. Those styles used by attorneys usually offer the best selection. Keep in mind that your stationery will serve to create the image of you within many people who have not had the opportunity of meeting you in person and serve to reinforce a positive image in those who have met you. You surely do not want this image to be gaudy; you want it to present a respectful, authoritative image. Some type of "uniform" is necessary to make a doctor and assistant stand apart from patients. White uniforms for assistants and white clinic coats for doctors are standard; however, this stark-white effect is not necessary. Coordinated pastels are different, avoid the "hospital" look, yet are in good taste. Seeing a professional assistant in a street dress or a doctor in casual attire caring for patients is certainly deflating to the professional image you wish to create. Because of time limitations, a doctor's influence cannot rest on the office visit alone. The use of literature and printed instructions will extend your influence by offering a constant reminder of your name, services, and concern. Their use helps to minimize the possibility of misinterpreted verbal instructions, they impress patients with your office's thoroughness and efficiency, and they indicate special consideration for your patient's welfare by not depending on the patient's memory alone. Thus, patients become more receptive to your recommendations. Many commonly used patient instruction sheets, diet forms, and exercise routines are available from the ACA Sales and Service Department. If a patient is left with the impression that the doctor is only interested in him when he is in the office, he will question the doctor's motives. Confidence in the doctor might be lost. You can enhance patient confidence in your abilities by showing the patient how to avoid stress during the holidays, while on vacation, during spring housecleaning, or while participating in sports and recreational activities. Special chiropractic-oriented instructions during the prenatal and postnatal periods are also welcomed. Helpful tips on eating and sleeping habits are often appreciated when not accompanied by a sermon. A gift of these tips will prove that you care about the patient's welfare. When a new practice is being established, advantage should be taken of a published announcement. The format is usually a two-column display about 2 or 3 inches high, containing essentially the same information as your opening announcement card. In large cities, weekly suburban newspapers and shopping guides are usually better media economically than daily metropolitan newspapers whose distribution covers an enormous area. Other space "advertising" is best handled through publicity news releases. Making as many personal contacts and establishing positive impressions is important to any doctor, but it is vital to the new practitioner. To meet people, obviously, you must go where prospective patients and centers of influence are. 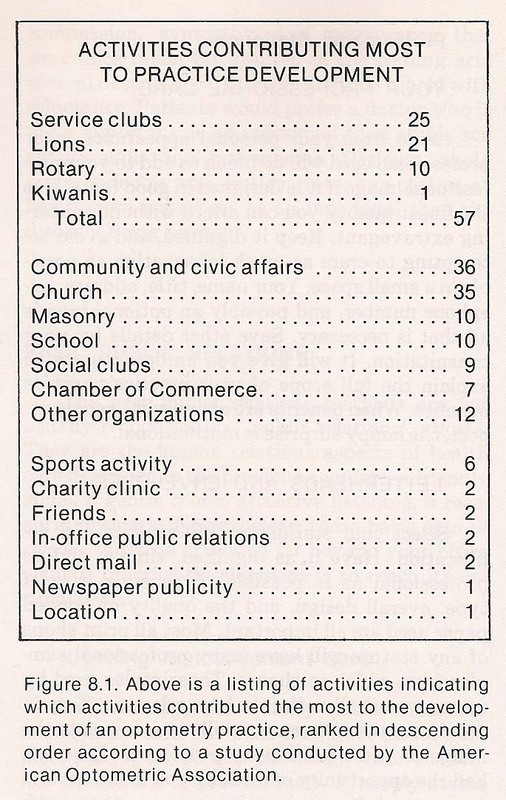 A good method, especially with small town and suburban practices, is to take an active role in two or more nonprofessional organizations such as a service club or a civic group (Fig. 8.1). Practice development begins with a desire to serve others. Such a service attitude is not a gimmick. Thus, when you join clubs and organizations, it should never be solely to gain attention and recognition. You can only expect to receive in the same spirit in which you give. If you give sincerely of your spare time to community affairs, the community will return in kind. Dedicated service is the medium to further your professional image. (3) offering leadership to Boy and Girl Scout organizations, YMCAs and YWCAs, and other youth groups offer excellent vehicles for exposure. When you are active, you meet people directly and indirectly, and meeting people and having them know who you are and what you do is an objective. Community services also offer excellent vehicles to become appreciated and respected. Some doctors have found it most rewarding to teach first aid classes in adult-education facilities, donate some hours to a chiropractic welfare clinic, serve as a coach or team physician to a Little League team, conduct scoliosis screening tests at nursery schools, and other similar service opportunities. Many find active participation in church activities highly rewarding. Use your conscience, imagination, and talents. Such efforts give you an opportunity to meet people, develop pleasant relationships, and to obtain positive publicity. However, your contributions of money and the time consumed must be kept in balance with your budget and good judgment (Fig. 8.2). Strictly personal activities keep your enthusiasm up, broaden your interests, and give you further opportunities to meet people. Activities such as participative sports and being an active member in an athletic or country club give you an opportunity to meet people. Recreational activities such as dancing, bowling, sailing, and hiking are excellent ventures when conducted with a group. Hobbies such as music, stamp collecting, painting, karate, mountain climbing, etc, also give you a chance to make more friends and gain publicity if these interests are not kept secret. They give you something to talk about and give others something to say about you. In addition to birthday cards, thank-you notes, and anniversary congratultions, many offices will make periodic mailings to lists of patients and community "centers of influence." These mailings will usually have health information of a seasonal nature or incorporate tips on proper nutrition, exercise, safety guidelines, and other topics of public interest. Mailings should be tastefully done so they do not look like advertising "flyers." Any literature, material, or event associated with your office should be carefully and thoughtfully planned to be in keeping with general community customs and professional dignity. The ACA offers a publication titled Health Perspective. The contents include family health features and an interview with a famous person who has had a positive experience with chiropractic. Issues are available in lots of 1000, and your personalized imprint may be included if you desire. Also, the Foundation for Chiropractic Education and Research (FCER) has an excellent lay newsletter called "Staying Well" (Fig. 8.3). Chiropractic expertise is needed in every community, but practice development is not achieved by sitting in a new office and waiting for patients to walk in. The old adage, "Out of sight, out of mind," is usually true. At least, it is true for professionals beginning solo practice. A license to practice does not assure a successful practice. Practice development requires getting noticed, known, and remembered, and ethical considerations and finances establish certain ground rules and limitations. Robinson points out that the professional office has the same basic factors to contend with in patient procurement as a businessman does in obtaining customers --only the names change, and some of the methods must be refined. For example, both must attract a clientele, offer services that will encourage return when the need arises, and communicate positive messages to others. In addition, both must "advertise." In contrast to a business, however, ethical restraints, professional decorum, and good taste restrict an "overnight" success for any professional office. Everyone gets noticed and known to some extent by passive chance and by conducting everyday affairs. However, this is not enough for the person who needs to achieve this objective in a hurry. The new practitioner, for example, must actively arrange for it to occur and to make it happen frequently. Public opinion is the concert of individual opinion. It is based on information and belief. If it is wrong or shallow, it is so because of false information and consequent erroneous beliefs. It is the obligation of everyone who meets with or communicates to the public to assure that the public has full and correct information --specifically, to assure a positive image of chiropractic. Although many doctors realize the need for recognition and a more positive image, few grasp the full basis of public relations as it applies within a profession. Some fault of this rests in the singular term itself, public relations, which would be more explanatory if referred to as publics relations. A well planned program must consider several publics. In order to make a public relations message effective, we must establish a line of two-way communications. Two-way communications means that we must learn the feelings and opinions of the publics we wish to impress. To do that most efficiently, we must first determine the general publics to which we are aiming our message and determine if there are any subpublics that are especially important (eg, young, old, management, labor, self-employed, etc). Undoubtedly, appeals will be different for each public and each subpublic. There is no doubt that public confidence is essential to public relations success. Unfortunately, too often participants in a public relations program get overcome with the tools and tend to concentrate solely on the means rather than the end. Merely getting chiropractic mentioned in the newspaper, a chiropractic spokesman on a television program, or a speaker to address a meeting is not good public relations per se. The positive results that may or may not come from such exposure is good public relations. Thus, the amount of public confidence built into a public relations programs becomes the determining factor of the soundness and effectiveness of that program. Exposure, any type of exposure, therefore, is not the name of the game, as some would lead you to believe. Positive exposure that fits into the overall plan and has a role in building public confidence is the key. It is essential to understand that chiropractic does not merely need exposure. It needs positive exposure, well-timed exposure, and well-planned exposure that fulfills its role in the overall progress strategy. Like the health of an individual, public relations is in a state of constant flux. Therefore, it is foolhardy to assume that once a "healthy state" is achieved the job is done. Consistency is the only key to security. An on-going public relations program is a must if a positive image is to be achieved and maintained. A sound program is necessary to get a new practice established, and an on-going program is necessary to maintain and build an established practice. It becomes necessary, therefore, that the techniques and approaches used in building public confidence should change from time to time and be influenced by current conditions. In this respect, a good public relations program is ever-changing --building upon its foundation of previous campaigns, but changing to meet new conditions, new opportunities, and new challenges. Public relations is not a cure-all, nor should it be considered a one-treatment method for correcting a traumatic public-opinion problem. The primary function of public relations is not to put out fires and put down bad publicity, but rather to create a positive environment that resists hazardous public relations situations. In its most effective form, chiropractic public relations is a preventive-health method of assuring public confidence. It requires well-defined objectives and consistency of purpose. In terms of involvement, it is a 12-month-a-year activity, year in and year out. While most doctors think that public relations is good for the profession, some have a tendency to think that it is someone's else's responsibility (eg, the district, state, or national chiropractic associations). Actually, public relations is everyone's job. The most successful public relations programs are those in which everyone assumes a role, performing a function so that effort is covered at every level --community, county, state, and national. Total support is what puts teeth into campaign planning and insures its success. Cooperation at every level takes the gaps out of any program by assuring total coverage. It is a reciprocal effort in which what is done nationally gains strength from localized support and what is done locally is reinforced by national efforts. The need for public exposure by a minority profession is very great. There is a large percentage of the American public that still does not know what chiropractic is, what it does, or how it does it. Yet, it is fair to say that all professions are limited by public knowledge. (3) where you are located. The art of getting known quickly is a discreet compromise between being overly shy and overly assertive. Both extremes are self-defeating, and right action takes some experience, initiative, and a feeling for correct timing. Following are several methods to get known quickly in your community. Distribute Your Cards Liberally. In our normal affairs, we come into contact with many, many people. We make contact with numerous sales people in retail stores, gas station attendants, waiters and waitresses, barbers and hairdressers, and an almost endless list of new people just in the normal conduct of our lives. Think about the many markets, clothing stores, garages, hardware stores, bookstores, etc, in your community that you will have occasion to visit. This list can be expanded many fold if you do not frequent the same places every time; ie, eat at different restaurants, shop at competitive stores, spread your money and image around. Each contact is an opportunity to become known and make a positive impression. The best way to obtain rapport with strangers is to ask them for help. This compliments their intelligence or taste. For example, if you can't decide between no-lead gasoline and gasohol, ask the opinion of the attendant at the gasoline station. If you can't decide between the ribeye and the sirloin strip, ask the waitress to choose for you. If you can't decide between the blue shirt or the brown shirt or blouse, ask the clerk to help you make a decision. If you can't decide between the color of file cabinets to buy, ask the opinion of the clerk at the office equipment store. When suggestions are made, follow them and state your appreciation. This will establish a positive relationship and give you an opportunity to introduce yourself, to tell them what you do, and to give them your card in the event either they or one of their friends need health services. It is not difficult to distribute 180 cards a month, 2160 cards a year --that's only six cards a day and an easy goal if you are not hibernating. You will harvest when you plant quality seeds. This positive effect assumes, of course, that you are dressed professionally and act professionally. Don't expect to make a professional impression when you are wearing jeans and a T-shirt. It is also good policy to also have cards made up for your professional assistants and to encourage them to distribute them freely. Their distribution will add to your efforts. Follow-up. When people do little courtesies for you, mail them a short thank-you note in appreciation. It firms your initial positive impression. These courtesies may not be important things. They may just be a helpful suggestion by a clerk, a helpful tip from a fellow club member, or some helpful advice from some acquaintance. It is easy to take little courtesies for granted and to forget them. If you carry a small notebook with you and collect several names each day to follow-up on, you will soon make hundreds of positive impressions by doing the unexpected. Don't Be Anonymous. One highly successful practitioner writes a thank-you note on the back of his professional card whenever he leaves a tip in a restaurant. He asks the name of the waiter or waitress if a "name badge" is not worn and simply states, for example, "Thanks, Kathy, for your especially good service," and places the card face down over the tip when he leaves the table. This doctor gained a positive reputation quickly in his community because he refused to be anonymous. Do the Unusual. Remember, it's the extra and unusual that impress people the most. It's usual to send greeting cards at Christmas. It's unusual to send cards at Thanksgiving. It's usual to have black-and-white stationery. It's unusual to have blue or brown letterheads on tinted paper and typed with a matching typewriter ribbon. There is nothing unprofessional about being unusual if it's done in good taste. Congratulatory Letters. A practice receives recognition in proportion to the recognition it bestows. Local newspapers offer an abundance of articles of personal achievement that will give you leads (eg, promotions, award winners, new businesses, etc). When a person receives a congratulatory letter from you, it will be appreciated and you will be remembered. The office that "doesn't have the time" to get involved in community affairs is all too often the office in which the community doesn't get involved. It is not difficult to understand that when you talk good about other people, they will talk good about you. Levoy tells the story of how a newspaperman amused himself one summer day by sending telegrams to 20 acquaintances, randomly selected. The body of each telegram contained just one word, "Congratulations!" Yet, as far as he knew, not one of the recipients had done anything in particular that warranted special recognition. However, each person that received a telegram responded with a letter of thanks. It appears that each had done something that was self-regarded as clever and worthy of a congratulatory telegram. Activities involving communications media personnel usually involve an expertise that the average doctor does not possess. To meet this need, the American Chiropractic Association has made available for the profession a comprehensive portfolio, the Media Action Projects kit (Fig. 8.4). The MAP kit is designed to help chiropractic associations and practitioners develop positive relations with radio, television, and newspaper personnel. All the necessary procedures to build an in-depth campaign are explained. Specific guidelines are offered for strengthening media relations and improving public communications benefits. Some sample projects are briefly described below. How to place live and transcribed radio spots and television public service time (ie, without cost), press information, methods for dealing with controversy, etc, are described in the MAP kit (Fig. 8.5). An abundance of how-to facts, proven dos and don'ts, and a plentiful supply of samples and forms are offered. How to gain accurate and timely news coverage is essential to a good public relations program. The MAP kit explains how to plan your efforts to gain news coverage, set up an effective media-release program, and have the inside facts in the strategy of obtaining thorough news coverage and building your mailing list. Ready for release are 10 sample news releases on general health and safety, 10 releases on correct posture, two releases on vocational guidance, and two releases on spinal health. The kit also explains how to set up a "Press Information Hotline" to maintain a steady stream of accurate information to the media at economical costs during special events and how to contact local radio and television advertisers to denote a portion of their time to air public service announcements at no cost to you. A well-rounded public relations program should include space coverage in the print media. The MAP kit exhibits a number of newspaper display and drop-in announcements that local newspapers may use as a public service (Fig. 8.6). These announcements are professionally designed and offer messages in the public interest. You will benefit from knowing how to seek out public-service space in local publications and how to obtain free media space. There are two sample form letters designed to get your local program into action, nine prepared display announcements, five senior citizen drop-in announcements, and four general health drop-in announcements (Fig. 8.7). A complete program is in this one project for building a logical strategy for increasing positive space exposure. In addition to magazines, newspapers and shopping guides offer an ideal medium for exposure. The newspapers most interested in these helpful messages are community newspapers, weekly newspapers, and "shopping guides." The MAP kit explains several simple actions for placing public-service health columns and describes the many prepared health columns available from the ACA (Fig. 8.8). You will be shown a proved methodology for promoting the use of these columns as well as be able to put the plan to work through sample form letters to editors. The American Chiropractic Association has developed a most helpful portfolio for the profession titled Community Action Projects Kit. The CAP kit has been designed to assist local and state chiropractic associations develop positive community relations. These ethical methods of attracting patient or public attention offer an array of possible techniques worthy of consideration. The emphasis is on public service media rather than on personal advertising. This is not only because public service projects are felt to be more professional, but because they are more economical and more rewarding in the long run. No one office will use only one technique, nor will one office use all the techniques. Each doctor in concert with the office staff will choose those that appeal to their individual personalities and talents (Fig. 8.9). Chiropractic literature has always been a basic public relations tool as it offers the space to tell a story in more detail than spot announcements within the mass communications media. Distribution through your office is the easiest and most obvious method of using chiropractic literature, but it is limited in scope as it narrows your efforts to people who are already patients. A more comprehensive program would include several no-postage methods of distribution such as at service counters of retail stores, through local business billings, or by libraries and teachers. Obviously, the literature selected should be of a general "health awareness" type, serving in the public interest, that is devoid of a personalized imprint that would label it as personal advertising. Good planning and timing are the keys to the effectiveness of such a program. For example, chiropractic travel tips can be distributed through automobile clubs, travel agencies, at airline counters, and bus depots. Many major roadside restaurants and gasoline stations have literature racks available for public service literature. Motels, insurance agents, and sporting goods stores are often helpful distribution centers, as are industrial personnel directors and safety engineers. The CAP kit shows how you can benefit by distributing chiropractic literature most effectively, how to leverage placements, and how to implement several no-postage methods of distribution (Fig. 8.10). It offers excellent examples of target-minded planning, three effective mailing projects, and a method to use literature strategically within the educational community. Public traffic areas offer excellent benefits from displaying attractive bulletin board posters. With the guidelines offered within the CAP kit, you will benefit by learning how to place public-service posters and how to master the simple steps necessary for strategic placement that will gain the greatest impact. Posters offer low-cost community exposure when placed in foot-traffic areas such as banks, libraries, store windows, supermarkets, health spas, industrial plants, public gathering spots, arenas, and auditoriums. Some offices develop a "Posting Committee" among interested patients to help increase community health awareness, especially during Correct Posture Month and Spinal Health Month, which offers great opportunities for publicity (Fig. 8.11). With highway traffic increasing each year, bumper-strip messages offer benefits of noncompetitive communication. The CAP kit offers guidelines to set-up such a program, shows you seven proven ways in which bumper strips can be used effectively, and how you can help establish an effective, economical program in your area. For example, auto clubs, insurance agencies, civic groups, local trucking companies, taxi companies, bus companies, industries with fleets, and other organizations are often helpful in distribution. Owners of automobiles have enthusiastically embraced the use of bumper stickers to give themselves a sounding board for their personal viewpoints on many diverse subjects --from the support of local political candidates to the support of personal philosophies. On all sides of issues and in between, the bumper sticker is used as a strong display medium to increase public awareness. ACA's bumper stickers are an excellent method of communicating messages that are universally accepted. They are attractive, professionally designed, and printed on quality stock --becoming a strong carrier of good public relations in your area and an important asset in reaching your public relations goals. Billboard messages have proved themselves over the years to be an important aspect of a multimedia public communications program. The CAP kit shows you how to initiate a program and how you can benefit from obtaining free space and posting labor. Free public service billboard space can often be obtained from posting companies for display of ACA public service billboards. Although the posting company may furnish the costly space without charge and often the posting labor, you will need to purchase the posting papers that contain the various messages. As with other media, the "secret" of gaining free exposure is asking for it. There are certain periods in the year when some outdoor advertising companies prefer to have a fresh, attractive, public service posting on their open boards rather than a blank space (Fig. 8.12). Also, some companies reserve some locations specifically for public service messages. Ask and you will receive. Your office may wish to join with others in a project of managing an exhibit at fairs and community conventions. Exhibiting at fairs and conventions offers many benefits in public exposure. The CAP kit shows you how to theme, design, and develop an exhibit via proved guidelines. There are county and city fairs, along with festivals and other formal celebrations. People from all walks of life attend these types of functions, and the managers of these affairs usually look for as many interesting exhibits as they can as attractions. This gives the profession opportunities for favorable person-to-person exposure and for events around which to develop positive publicity. A chiropractic booth or exhibit is an excellent method to build the image of the profession and educate the public of chiropractic. A booth is easy to set-up and maintain, and it can be established with the minimum budget of a district chiropractic association. If you help plan an exhibit at a fair or convention, remember that people are generally in a fun-mood when attending such events. They have much to see in a short time. Thus, make your exhibit simple and interesting. One of the weakest links in media relations is that with the journalistic community. The ACA's national Health Journalism Awards Program offers your office an excellent method of building positive relations with journalists in your area. One goal of the program is to motivate the public to practice good health habits. Another is to keep as many people as possible informed of the advancements in health care that will increase the quality as well as the quantity of life. Furthermore, the program honors those journalists who write and produce superior material. Finally, the program is designed to stimulate journalists to be free thinkers, not bound by traditional, social, or political pressures; to encourage them to increase their depth and scope in writing health-related stories, and to help them understand more fully all aspects of healing, including chiropractic. You can obtain complete contest rules and entry forms from ACA headquarters. Quantities are available for distribution to local media. The awards program and instructions for obtaining rules and entry forms are also announced each year in various national publications designed for journalists. Members of the profession and their assistants are asked to be on the lookout for potential contestants, especially in the category that encompasses consumer-oriented media and to urge participation through the publishing or production of an eligible work during each year. Any ACA member may submit the name of a contestant eligible in any category if the entry is accompanied by a printed or typed copy of the story or production. The CAP kit shows you how to link local efforts with the ACA's national "Health Journalism Awards Program" to build positive rapport at the local level. You will benefit by knowing the basic strategy and what you can do to develop your relationships with magazine and newspaper personnel and publishers. Nothing communicates like personal communication. If you are capable of delivering an interesting talk before service clubs and community organizations, this talent offers an excellent opportunity for public exposure and public health education. Such talks should be planned to accommodate the interests of the particular group involved. All that is usually needed is a telephone call to the club's program chairman to set a date after your topic has been described. If you are not gifted as a public speaker, the ACA has several audio-visual presentations that require only a short introduction and a follow-up question-and-answer session. The public platform is one of the best ways chiropractors may tell the chiropractic message. Those who take the time appear to be associated with more successful practices than those who "don't have the time." The development of public speaking ability is a decided asset in enhancing community understanding. Unfortunately, only a few professionals take advantage of opportunities to speak. When they do, they become known as authorities as the result. Great oratory ability is not necessary to prepare an interesting talk that is honest, down to earth, and has a dash of humor when appropriate. A motivational presentation is just a presentation that recognizes people's wants and needs and shows them how they may be satisfied. The opportunities for you to speak out in behalf of chiropractic are almost unlimited. As an asset in this behalf, the ACA has developed a Speaking and Personal Betterment Guide. This guide includes sections on how to become an effective chiropractic speaker, how to organize and sustain a chiropractic speaker's bureau, how to handle television and radio appearances, proposed speech ideas, how to handle questions that demand answers, and secrets of professional speakers (Fig. 8.13). If you wish to refine your speaking ability through practical experience or if you are hesitant about your ability to deliver a lively and interesting talk, consideration should be given to joining a local club of Toastmasters International. Most every city has a club. The organization consists of local people interested in improving their communication ability by group meetings where each member has an opportunity of gaining vocal training and experience. For more information, write to Toastmasters International, 2200 North Grand Avenue, Santa Ana, California, or look for them online. The CAP kit shows you how to get a Speakers Bureau in high gear, how to broaden your communications abilities, and how to plan an organized program. You will also benefit from learning about ACA's audio-visual supports, how to get a group motivated and organized, and how to leverage the advantages of a Speakers Bureau in your area. Sample forms, form letters, speeches, and radio and television appearances are also included in the kit. The ACA has a number of high-quality movies and slide/sound programs that have proven to be excellent public relations instruments when shown. Topics include an overview of chiropractic health care, senior citizen problems, a career-oriented film, preventing back injury, correct posture, and other subjects of public interest. Industry offers a great opportunity for positive exposure. Some companies are faced with a higher than necessary percentage of absenteeism. Large numbers of employees don't make it to work on Mondays because they tend to overdo their weekends; likewise, vacations are often followed by absenteeism due to illness from stress and overindulgence. This project is directed toward industrial companies with a large volume of employees. The aim is to help industrial relations directors, personnel directors, and top management combat health problems that affect employee production. The program is designed to involve the employee by the creation of a health-education program concerning weekend and vacation activities. It will increase employee awareness of the hazards of overzealous activities (Fig. 8.14). The CAP kit shows you how to conduct an impressive orientation program for industry and how to put the program into action at the local level. You will have the advantage of a sample letter to an industrial relations director, a sample article for company publications, and an 18-minute prepared speech on summer safety. To support your local project, the ACA offers collateral materials such as sample cover letters, posters containing rules for a "Limerick Contest," contest entry blanks, and a sample press release that announces the contest to the public for use in general media (Fig. 8.15). Union locals are quite receptive to talks on health and safety. They are often good sources to use in the distribution of health-education literature and cooperation in health-education campaigns. A telephone call to the union's secretary is usually all that is required to schedule a meeting to discuss a program. Any well-rounded public relations program should incorporate some involvement in the political scene. The CAP kit shows how you will benefit by knowing how to get involved and how to evaluate a candidate. Everybody appreciates personal recognition. The CAP kit explains, in multiple ways, how to build centers of influence through the development of a community awards program. You will learn how to set up a local Awards Program that will add community leaders, decision-makers, and policy formers to your chiropractic team. Some doctors make periodic contact with all hotels and motels in their immediate area. Often guests may injure themselves and require the services of a doctor of chiropractic. Thus, it is helpful that hotel and motel management is aware of your office's services and location. Senior citizens form an important part of the typical chiropractic practice. The CAP kit shows how to build a strong rapport in your community by showing a award-winning senior citizen documentary film throughout your area (Fig. 8.16). You will benefit by learning how to get thousands of dollars in publicity on a small budget that promises long-term benefits. Spreading the story of chiropractic education is another excellent medium for personal exposure. Communicating the story of chiropractic education adds prestige to present practitioners as well as assures growth of the profession. Less than 2 decades ago, there was hardly an identifiable college or university that offered a prechiropractic curriculum. This is not true today, as can be demonstrated by a review of scores of college catalogs. Although the number is increasing each year, there still remain thousands of junior colleges, senior colleges, and universities that do not include a prechiropractic curriculum. There are normally colleges within or a short distance from most communities. Promotion of prechiropractic and paraprofessional courses in area colleges provides an excellent opportunity of enhancing relationships with the academic community, establishing interprofessional dialogue, and developing mutual understanding. The CAP kit explains how to communicate the benefits of accredited education, how to promote a prechiropractic course in local colleges, and how to promote the distribution of vocational guidance materials. You will learn how to speak about chiropractic career opportunities and benefit by having a sample career-oriented speech for reference. You will also learn how to benefit from presenting chiropractic's full-color career film. In addition, the ACA's Vocational Guidance Kit (Fig. 8.17) and the FCER's book, Chiropractic Health Care, deserve placement in all public, high school, college, and university libraries in your area. With the increasing recognition and acceptance of chiropractic as an entry into the mainstream of health provision and educational organizations, there is a corresponding need for higher quality reference material to meet the lay thirst for reliable information. These two items are fine examples of placement opportunities to further credibility and enhance the professional image within your community. These publications will be discussed further in this chapter. A well-planned textbook jacket program is a good opportunity to introduce your office to the educational community. Once you elect to distribute chiropractic-oriented book jackets, order a quantity large enough so that your program will be implemented without severe reservation or limitation. It would be foolish to request cooperation and then not have enough materials available to meet the need of a cooperating school. After your textbook-cover campaign has been completed, it is a good idea to follow-up by contacting cooperating educators and personally thank them for their participation. This meeting would be a good time to discuss the possibilities of participating in a career-day program, a presentation of health education to the student body or health classes, placement of library reference materials, holding a posture screening clinic, discussing the ACA's May Correct Posture Month Poster Contest, explaining the ACA's October Spinal Health Month Essay Contest, or any other activity that would be of interest to the educational community. The ACA's CAP kit shows you how to prepare a successful campaign and how to follow it up to gain optimum benefits. You may wish to consider bestowing a "Community Service Award" to cooperating educators. Such a program will give you an opportunity for broader community publicity by associated news releases, and it will firm your relationship with the participants. All necessary materials are available from the ACA's Sales and Service Department at minimal cost. In addition to efforts to impress children through mailings to teachers, their participation in the May Correct Posture Poster Contest, their participation in the October Spinal Health Essay Contest, and their exposure to your general campaign, you might also embark on another project that reaches children directly. This program consists of distributing coloring books that promote good posture such as ACA's "Peggy & Pete Posture Activity" book. These booklets can be distributed from your office, at youth centers, or at any place in your community where children gather. Correct Posture Month is celebrated each year during the month of May. Proved guidelines for associated public relations are offered in an ACA portfolio titled "Correct Posture Month Action Projects" kit (Fig. 8.18). Steps are outlined in the CPMAP kit for achieving excellent news coverage, acquiring radio and television public service time, obtaining official proclamations, using literature and exhibits effectively, obtaining bulletin-board exposure, and setting-up a well-organized "Posture Poster" contest. Sample news releases, form letters, rating sheets, invitations, radio public service announcements, live and prepared radio and television station-identification spots, collateral posture and physical-fitness literature, follow-up letters, and two sample speeches are included in the kit. Another project offering excellent benefits that is explained in the CPMAP kit is the organization of public posture evaluation clinics. You will benefit by knowing the scope of such a clinic and the recommended examination procedures, where to locate a clinic, how to equip and staff a clinic, and how to gain the cooperation of professional and nonprofessional groups. You will learn how the public should be informed, how to budget and organize the program, how to get school participation, and how to report findings to parents. Special publicity suggestions are included in the kit in addition to two prepared news releases about the program. Also included are sample forms, report blanks, and a synopsis of a posture-profile examination program. Spinal Health Month is celebrated each year during the month of October. Tested guidelines for associated public relations are offered in an ACA portfolio titled "Spinal Health Month Action Projects" kit. Steps are outlined in the SHMAP kit for obtaining official proclamations, achieving interesting news coverage, acquiring radio and television public service time, using literature and exhibits effectively, establishing a spinal essay contest, obtaining bulletin-board exposure, and setting-up spinal check-up stations and office visitations in your community. Sample news releases, an official proclamation, form letters, invitations, clinical and legal forms, radio public service announcements, live and prepared radio and television station-break spots, essay rating sheets, collateral posture and physical-fitness literature, and follow-up letters are included in the SHMAP kit. A study was conducted in 1974 on the chiropractic profession. It was a part of the manpower component of the Comprehensive Health Planning Council of Central Massachusetts, Inc. One of the six conclusions drawn, which is important to emphasize here, was that "The major reason for not using chiropractic services is lack of information about what it is, what it can do, and how it does it." This point well underscores the need for continual cooperation within media and community projects, as well as participation in projects associated with Correct Posture Month and Spinal Health Month. (4) Spinal Health Month Action Projects. These inexpensive portfolios, offering you a comprehensive program for each quarter of the year, are available separately from the ACA Professional Services Department or all four kits are available under one cover as the Public Relations Manual. The American Chiropractic Association also has available three comprehensive reference manuals developed by this author that your office may find extremely valuable in setting up and maintaining communications quality and continuity. They are Guidelines to Successful Meetings, the Political Action Manual, and Chiropractic Health Care. Guidelines to Successful Meetings. If you are ever asked to organize a professional-caliber meeting or if you are asked to assist, your office library will benefit from this comprehensive how-to manual. The contents include planning, protocol, etiquette, speakers, audiences, programming, environmental control, equipment, and service considerations --all potential pitfalls of the unwary. The important points involved in planning a convention are also described. Political Action Manual. As citizens of this great nation, it is the privilege of doctors of chiropractic as well as a responsibility to elect representatives to local, state, and federal government. This manual explains the fundamental political process in the United States, shows how to become active in the party of your choice, and describes how your efforts will be more significant to your community, state, and nation (Fig. 8.19). Chiropractic Health Care. This basic reference is probably the most frequently quoted singular piece of chiropractic literature within the chiropractic profession. It offers an abundance of illustrations. The subject matter offers an overview of the historic roots of the profession, the rediscovery of chiropractic in the United States, professional and clinical disciplines, the uniqueness of the chiropractic approach, chiropractic health care today, chiropractic education and standards, research and investigative programs, chiropractic in foreign lands, and sources of credible information. This basic reference serves as an excellent placement in libraries; with legislators, editors, educators; and all those who may have an interest in chiropractic health care and the profession. Copies are available in case-bound or soft-cover editions from either the ACA or the Foundation for Chiropractic Education and Research (FCER). The ACA also has available two other references that you will find helpful. They are the Vocational Guidance kit and the Posture & Body Balance kit. The Vocational Guidance Kit. This is a portfolio that offers quality information designed for career counselors and prospective chiropractic students. It was developed with CCE standards in mind. The literature discusses choosing and planning a career in chiropractic, the opportunities available, and an appraisal of the profession's future. The Posture & Body Balance Kit. This portfolio offers a sampling of available literature designed for children and classroom use, drawing attention to the necessity of correct posture and physical fitness. A wide assortment of folders, posters, and other materials are offered that are appreciated by elementary and junior high school teachers and students. In business, the term promotion means using communications between seller and buyer to change attitudes and behavior. The typical methods are advertising and personal selling. In professional health care, promotion means communications between an office and a prospective patient. The typical methods are external public relations, in-office human relations, and media advertising to a most limited degree. Success in professional advertising is more than just spending money and hoping. "Do-it-yourself" advertising is usually money wasted that could be better invested in more productive efforts. Research has shown that the average person is bombarded with about 2,500 advertising messages every 24 hours. Thus, the novice should not enter this fierce competition for a viewer's eyes, a listener's ears, or a reader's mind without careful deliberation and professional counsel. Success mandates critical planning, professional implementation, and periodic evaluation of programs by specialists. Such expertise is found in reputable advertising agencies and public relations firms, but the costs usually run far beyond the capabilities of a solo practice. Our purpose is not to encourage or discourage your consideration of mass media advertising. Rather, it is to explain the basic factors involved so that you will be in a better position to judge whether it will be beneficial or harmful on a long-range basis. In the business world, marketing tries to establish a mutually satisfying exchange between buyer and seller. Gaedeke/Tootelian describe the major functions involved in this process as market research, product planning, pricing, distribution, and promotion. The term "market mix" is made up of the latter four functions. These are the controllable marketing variables that a firm combines to satisfy its customers, and they also have implications within professional advertising when it is seriously considered. Today, the marketing concept of business has replaced the traditional sales concept that attempted to persuade a customer into purchasing a given service or product. The marketing concept seeks to identify customer needs and to develop products that will satisfy these needs. You will note a similitude in this to the human relations concepts described in Chapters Six and Seven of this manual. A study of consumer buying behavior, an outgrowth of the marketing concept, considers both buying habits and buying motives. As with most human decisions, these motives may be conscious, subconscious, or unconscious spurs, making the isolation of specific needs and desires a most difficult if not impossible task. Because of the limited financial resources of small businesses, target markets are selected so that marketing strategies can be maximized in areas of high potential. We see a correlation here when chiropractic advertising is directed to headaches or low-back pain, the two most frequent health complaints in the United States. This is called market segmentation in business, which essentially means isolating a subgroup from the overall market. Another important phase in marketing strategy is to carefully define marketing goals that are specific enough to be measurable and realistic enough to be achieved. Most professional advertising, at least chiropractic advertising, fails in these areas. Rarely are realistic objectives established beforehand or are the results measurable except from the question, "Who referred you to this office?" (b) there is no way of predetermining whether the final costs are justifiable. In addition to careful budgeting, advertising effectiveness is also determined by the message and where, when, and how it is communicated. This requires that the right message is prepared for and communicated to the right target group at the right time. It also requires selecting the best media, and the best media might be extremely costly. The typical advertising media used in chiropractic are the yellow pages, newspapers, radio, and television. Copy development should be taken most seriously. It is not difficult for the novice to inadvertently use a word or phrase that might be considered unprofessional, unethical, misleading, or fraudulent according to professional or legal criteria. Thus, the first prerequisite is to check with your Board of Chiropractic Examiners for legal guidance and your state chiropractic association for ethical guidelines. Measuring advertising effectiveness is difficult to accomplish because all your short-term and long-range practice development influences are hidden variable factors. Patients may state that they are responding to an advertisement, but they may have heard your name several times in the past without conscious recall. For this reason, advertising agencies use sophisticated, specific pretests and posttests, which are usually beyond the budget of small businesses and professional practices. Yellow-page display advertising for professionals is most effective with one submarket: newcomers to the area. Thus, costs are justifiable, if at all, only with practices that are located in resort areas or with those rare practices where transients comprise an abnormally large percentage of patient volume. The same money intelligently invested elsewhere would return a higher yield. Permanent residents use the yellow pages to look up the telephone number of a specific doctor that has been recommended or infrequently to find a doctor near their residence or office. Thus, all that is necessary for the vast majority of people using the yellow pages is your name, address, and telephone number; ie, the standard listing. A directional aid is sometimes helpful such as a major cross street or a well-known landmark. The premium costs for other than basic information are most difficult to justify, except in terms of ego gratification. Other health-care professionals have recognized this fact for many years. The people who make the most favorable comments about yellow-page display advertisements are the people whose business is to sell them and those doctors who have been "sold" them. Those doctors who feel they are cost-efficient have a most difficult time supporting their claims by credible measurement methodology. Most large display ads do not attract patients, they discourage patients. Prospective patients are not obtuse. Gaudy-looking advertisements reflect a doctor who needs patients, else he or she wouldn't be spending the money in such a manner. Prospective patients prefer a successful doctor, not one who needs patients. Would you select an optometrist or a dentist for a loved one by the size of a yellow-page display advertisement? Most people would not. The most sturdy trees grow slowly and develop deep roots, but they do not easily bend with the wind or wither with a seasonal drought. It is sometimes helpful to watch and listen closely to several unsuccessful practitioners. Undoubtedly, you will find that they are constantly attending unaccredited "practice management" seminars and spending huge sums on advertising. These doctors are often preoccupied with figuring out novel methods of how they may attract more patients because they are unable to develop a positive community reputation and a "referral consciousness." Advertising just takes money; community involvement and in-office human relations take effort (Fig. 8.21). In the last analysis, there is no way of determining how another person thinks or why he thinks as he does. This is true of colleagues and patients. But you can easily determine how YOU think and how you would select one doctor over another. If your spouse or a parent were ill, would you want the best care or would you go bargain shopping? What neighborhoods would you avoid in seeking a doctor? Why? How would you be impressed if the office's lawn needed cutting, if the steps were worn and sagging, or if the doctor's shingle was faded? How would you feel if the reception room was cluttered, the walls needed painting, the furnishings were well-worn and dusty, and unframed pictures and notices were taped to the walls? How would you expect the professionals in the office to be dressed and groomed? Would you expect them to be in street clothes or freshly laundered professional attire? Would you prefer personalized attention or to be treated as just another case? Would it matter if the doctor used "quick-print" stationery or engraved stationery? Would you prefer a doctor whom your friends have never heard of or one whose name is frequently in the papers associated with some community activity, health column, or a talk before a service club? Would you prefer a doctor who spends large sums on flashy newspaper or yellowpage advertisements or one who sends you personalized mailings offering practical health tips. Just what kind of professionals do YOU have confidence in? When you honestly and objectively figure out who you prefer and why, you will have a good idea of what most people prefer and why. Itinerant practice management "experts" can do no more. When it comes to human relations, apply your own likes and dislikes. Don't take on second-hand values. The many auxiliary techniques in practice development described in this chapter are just that --adjunctive techniques. They are helpful in bringing public attention to the benefits of chiropractic health care, establishing a positive professional image within the community, and getting people to know who you are and what you do. But always keep in mind that these techniques are auxiliary to and supportive of the key to practice development --referrals by current patients. Auxiliary techniques are designed to obtain attention and develop interest. Referrals require the development of desire and action, and these are in-office goals that necessitate personalized attention, service, and motivational education. Those of us who continually work in chiropractic realize full well the benefits of chiropractic health care. Our awareness must be communicated as a service to the sick and disabled. Since the minority health professions realize little "free" publicity as compared to traditional medicine, it is the duty and responsibility of every DC and CA to tell "the chiropractic story" to everyone, everywhere, at every logical opportunity of good taste. This takes the form of professional public relations. Such projects do a valuable service to the public and the profession, but these techniques should never take priority over offering the best in-office health service and human relations possible.